Nagi calls for Hayate, who recounts to him how Chiharu suggested a welcoming party barbecue. Nagi rejects that since she can’t afford it on the rent people paid, but offers up a curry party instead. 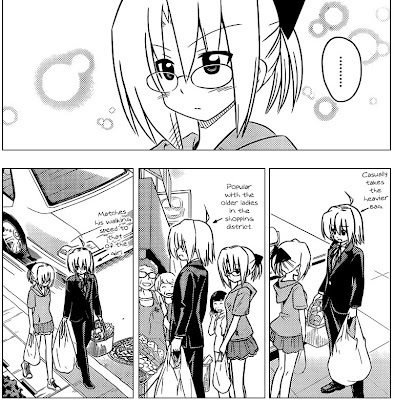 Hayate leaves to buy food and Chiharu accompanies him to help, providing he buys meat, even the cheap kind. While at the supermarket, Chiharu realizes that Hayate pays close attention to what people like and dislike. He also does a lot of other things right. 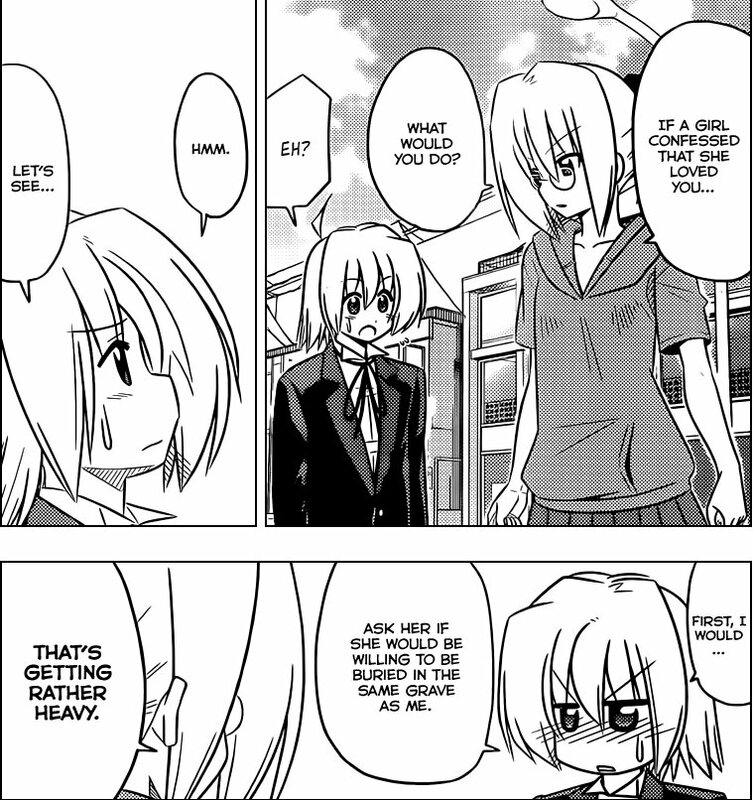 She wonders aloud on Hayate’s popularity, which Hayate thinks is impossible since Hina is always mad with him. Chiharu isn’t sure about that since she thinks that being causally treated kindly makes one feel special. Back at the apartment-house, Ruka is having a hard time, and wants Hayate’s help. Since he’s gone, Ruka gets depressed. Ayumu notices this and figures that people in a bind want to rely on somone and confess their love. 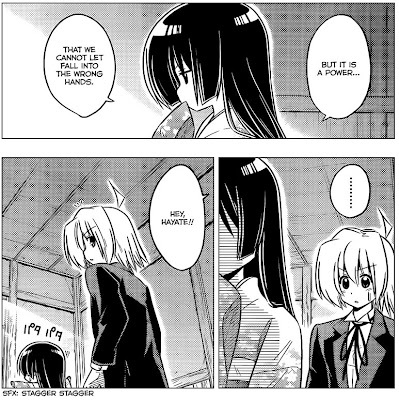 So, she decides to help Ruka. Ruka seems pleased by this and asks Ayumu if Hayate would become Ruka’s boyfriend if she confessed to him,. Chiharu’s outing with Hayate was a nice one, especially since of all the girls there (save Kayura) have some sort of feelings for Hayate. Chiharu would be down at the bottom of the scale, but she too could not help but notice Hayate’s charm, especially after he had notices that she liked peaches. 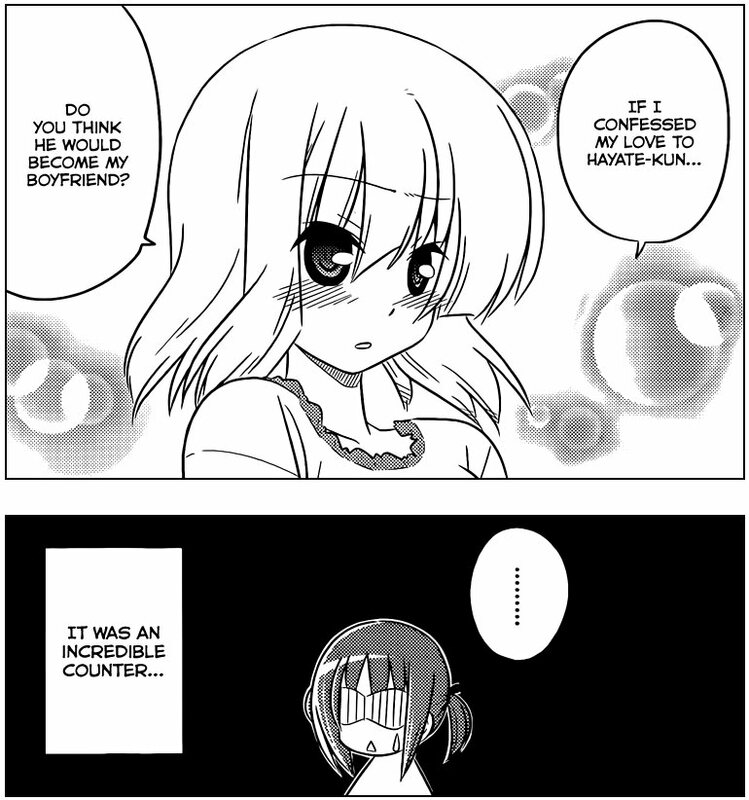 Other than for comedy purposes, Hayate’s answer to Chiharu’s question about a girl confessing to him was odd. I only say this because Ayumu has confessed to him. twice. I wonder if that’ll come up next chapter. As for Ayumu, her attempts to cut off any confessions by Ruka were amusing, as was Ruka’s crimping Ayumu’s plan by going straight to the heart of the matter. I’m looking forward to seeing how that goes. I find it stupid that Hinagiku isn’t even going to try and confess her love to Hayate. 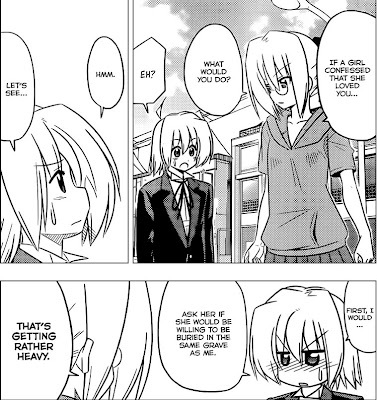 Hayate doesn’t think Hinagiku is in love with him because like he said, Hinagiku always gets mad at him. If Isumi can teliport, it would explain a lot about her alway getting lost. When you can pop between places, you never experence the trip between the two points. Without this experience you have no roadmap to follow when you travel by other methods like walking. The only question would be if Kenjiro-sensei planned this, or if we are smoking something funny.